In The Land Of The Living - Mostly!! Birthday Boy & Bestest Buddy Play Date!! Tee! Hee! Hee! Now before I show you what all of those elements from my last post added up to for my Mother-In-Law, let me just brag a little by saying I did NOT buy ANYTHING specially to make this giftie - it is made entirely from bits and bobs in my stash. See ... I KNEW there was a REALLY good reason to randomly add to my stash along the way! Tee! Hee! Hee! OK, no more suspense ... Wendy was right ... it's a bag. Was pieced leftovers from "Butterfly Hunt". 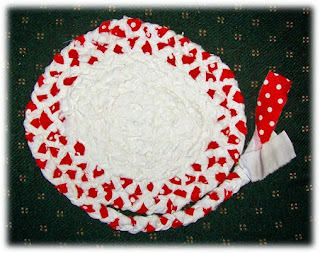 So ... there you go ... a fun pattern, a few left overs, a little bit of imagination - and a large dash of desperation!!! - and you can come up with just the thing for the MIL's birthday! 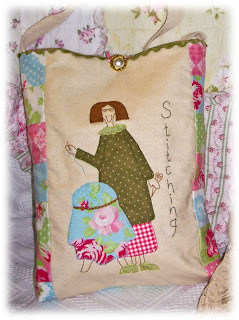 You'll see that I've stitched "Stitching" down the side, as my MIL is a stitcher too, so this is a project bag for her. I'm going to also make a matching pin cushion and maybe a scissor keep ... if I have time before we see her!! And I'm sure she will be reminded of her 'angelic' Daughter-In-Law every time she uses it! Oh ... wait ... I seem to have left the halo off the angel ... perhaps that's just as well! Tee! Hee! Hee! So, that's my second project finished for August and popped on my sidebar list of OPAM Challenge finishes - May Britt is already fielding email lists of monthly finishes - I forward any that come to me, so never fear that you'll miss out! Don't forget to update your sidebar list if you aren't able to send an email report, that way May Britt will be able to see at a glance what you've been up to ... end of month winner on May Britt's blog in the next day or so, so stay tuned! Not only does this little port still have it's original locks and leather handle on the outside, it has the original lining fabric inside. See ... my 'beautiful assistants' are showing it to you! :0) Not sure what treasures I'll pop in here or where I'll put it, but you can be CERTAIN that I will find a home for this wonderful new treasure! And thank you to the OTHER treasure in this story, my buddy LYNDA - thanks for thinking of me, Lynda - I LOOOOOOOOOVE my surprise!! OK ... so ... you suddenly realise that it's your Mother-In-Law's birthday TODAY - how did THAT happen?!?! I'm SURE it's NEXT week!! NOPE! It's TODAY ... and you haven't bought a giftie - GASP!! So ... What do you do??? 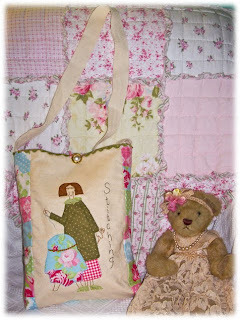 You head for the sewing room because SURELY you can find some inspiration in there ... RIGHT?!?! 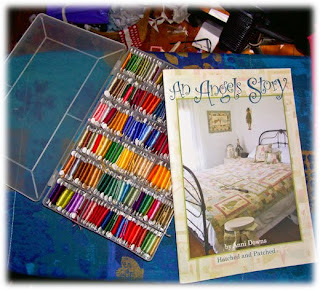 ... My embroidery thread box (note to self: still need a new one of these as this one is overflowing!!) and one of my fave books by the clever and talented Anni Downes ... OK ... the creative juices are flowing now! I know JUST what I'll do!!! I know I promised I'd be back much earlier in the week to tell you about my weekend, but as I was writing my post on Monday, I was already being stalked by something NASTY, HORRIBLE and MERCILESS ... A COLD!!! SIGH! Yes, My Beloved Geek Boy very KINDLY shared his cold with me (he says he can't figure me out - I'm always complaining he doesn't share enough with me!!Grrrr!!) and for the last few days I've been feeling BLAH! You know how it is ... you're not really SICK, just a bit miserable and snuffly with no energy. I'm feeling a little better today, though, and hope I'm on the mend, cos that "To Do" list just keeps getting longer and LONGER!! So ... what did I do last weekend? I went home to my mother! Tee! Hee! Hee! You see, the performance dates for the theatre restaurant I'm part of are creeping closer and we all have to have costumes organised by this coming Monday. And, although I'll happily sew CRAFT projects til the cows come home, I'm not actually very handy with PRACTICAL sewing, and trying to follow a dress-making pattern ... well ... let's just say I'd probably stand a better chance of understanding the instructions if they were in FRENCH! :0) My Home Economics teachers all despaired of me - though, they'd laugh their butts off now if they saw just how much of their pattern drafting lessons I actually use!!! So Saturday morning saw GB and I up much earlier than a Saturday morning usually warrants, the overnight bag was packed, the costume fabric and guideline pictures were thrown in and the dogs both loaded themselves into the backseat while GB had his back turned ... just in case we'd been thinking of leaving them behind!! Really must remember to get a photo of this next time we travel - very funny! 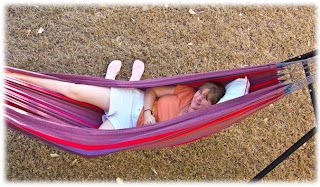 It looks like the hammock is swallowing Tiff!! Tee! Hee! Hee! 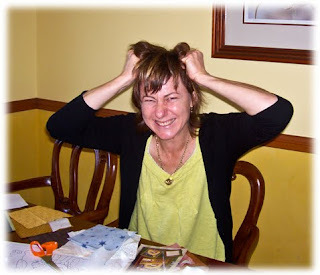 For those of you who haven't met Tiff before (via my blogging sagas!) she came to board with Mum and Dad about four years ago ... and hasn't left yet! :0) She's kind of like a foster sister these days and part of the family - not quite as silly as the rest of us, but we're working on that! Tee! Hee! Hee! 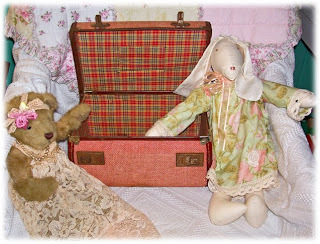 And when we arrived at Mum and Dad's, this is the sight that met me when I walked into "My" room (you know, the bedroom that was mine when I was growing up and is now the guest room). We were quite convinced that in the middle of the night there would be an ominous rumble and we'd be buried alive in an avalanche of Christmas boxes! Tee! Hee! Hee! 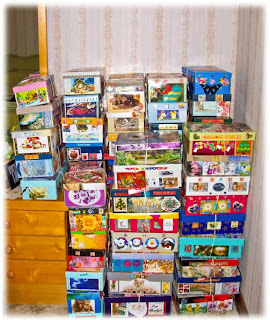 Now ... why, I hear you asking, does Kris' Mother have hundreds of shoeboxes covered in Christmas paper stacked up in her guest room? Actually, this is only a portion of her stockpile!! 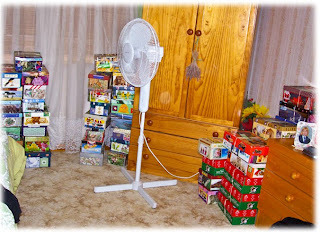 Let me explain ... Every year for the last 8 or more years, Mum has been the co-ordinator of their Church's efforts for "Operation Christmas Child". This is a campaign run by the charitable group, Samaritan's Purse, which sees millions of Christmas boxes distributed each year since 1993 to children throughout the world who are the victims of natural disasters and/or poverty. Each box is chock-full of goodies - practical things like items of clothing, toiletries and school supplies, as well as fun things like jewellery and toys. It is such a simple thing to be involved in - just pick up a few little bits and bobs each time you do the groceries and keep an eye out for back-to-school sales - and it doesn't cost a lot, but makes such an impact on the lives of disadvantaged kids. I'll often get funny looks going through checkouts with 20 packs of coloured pencils or 50 sharpeners or something similar because I've found a good special! :0) I know there are all sorts of very worthy charities out there that you're all involved with, but if you're looking for a simple way to lend a helping hand to someone, this might be right up your alley. Take a peek at the website - there's a really cute, short video clip explaining Operation Christmas Child, starring some of the "Vege Tales" animated characters. OK ... so ... that's what I got up to for the weekend - always great to catch up with Mum and Dad (and drop off a few more things for the Christmas boxes!!) but as I said, I've come back this week with a cold, so haven't been up to too much else. I have been, however, doing the final edit of my "Fairy Bears & Butterflies" quilt pattern and you'll all be happy to hear (I hope!!) that it will be printed on the weekend, so I'll be back with a pattern launch give-away next week - but I'll warn you now, it's not going to be a simple one, you'll have to put your thinking caps on!! And now ... 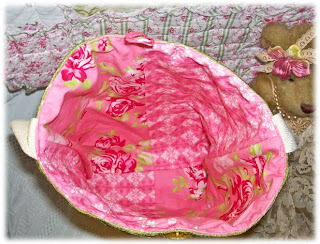 I think I've earned a cup of tea, then I'm hoping to get into my sewing room and do a bit - who knows, I may even manage to get another finish registered for my August OPAM list - don't forget to update your sidebar lists, gals!! May Britt's turn to choose the winner and send a prize this month, so stay tuned! In the meantime, hope you're all gearing up for a great weekend with some "fun time" scheduled! Til next time - Bear Hugs! 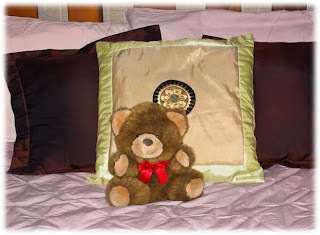 Now, since I'm firmly of the belief that you can NEVER have too many BEARS or HUGS ... I've asked Jenny to COUNT ME IN!! I know, I know ... I said I was going to only sign up for ONE swap this year, the SSCS swap with Chookyblue - something my Beloved Geek boy was VERY quick to point out!!! However, since I already spread hugs when I sign off (see bottom of page if you don't remember what I mean!!) and Jenny and Vicki have put some pretty strict guidelines on this swap ... I decided I could manage another deadline. "The main purpose of this swap is to make it a beautiful but inexpensive swap, especially for those who are unable to participate in other swaps due to postage costs overseas or due to items being large or heavy (also expensive to post). This swap is a size that can be posted in a mid-size envelope - much cheaper posting within countries and overseas, as it can post as a letter. 4. You must show the HUG SWAP button on your blog. Simply cut and paste the button photo from the top of this post, save it to your computer, upload it to your blog THEN link it to either my (Jenny's) or Vicki's blog." So ... there you go! While finding all the bits and bobs to add to swaps is fun, I also thought it would be fun to throttle back with this lovely simple swap with a sentiment close to my heart. Yeah ... no worries!! I can add two more things to my "To Do" list. Oops! Did you just hear said list SCREAM! Tee! Hee! Hee! If you'd like to join in the Hug-A-Thon, pop over to visit Jenny. I do have some photos from our weekend to share, but have to scoot off for now, so shall be back tomorrow to let you know what we got up to. Til then - BEAR HUGS!! When my Beloved Geek Boy's 40th birthday first made noises about approaching, I tried to get party ideas from him - did he want a BBQ, did he want to hit a local restaurant, did he want a pirate theme where we could play "Pin The Patch On The Pirate" ... (strangely, this did NOT appeal to him!?! And you think you know a person! Tee! Hee! Hee!) After about four months of suggestions and rejections, or just lack of enthusiasm, in exasperation I asked, "Do you just want me to organise a nice weekend away somewhere quiet?" His little face lit up, his gorgeous blue eyes sparkled and I got a resounding, "Oh yeah, that sounds good." After picking myself up from the floor where I'd been knocked by this great wave of enthusiasm ... 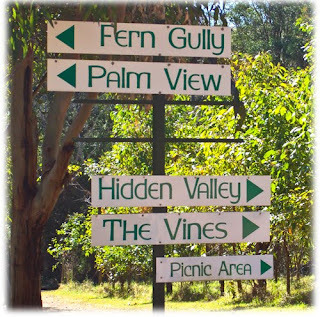 I booked a cabin at the Ravensbourne Forest Chalets, a wonderful spot we've enjoyed for a night previously, that is about three quarters of an hour's drive from Toowoomba. That's where we headed on Friday. Well, what do you know ... a little furry friend to greet us! Now, surrounded by such romantic ambiance, what do you suppose was the first thing my Beloved GB did? 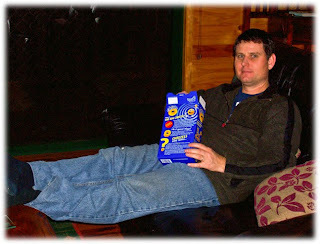 Feet up and into the Cheesles! He's a romantic fool, my boy! Tee! Hee! Hee! Isn't is GORGEOUS!! 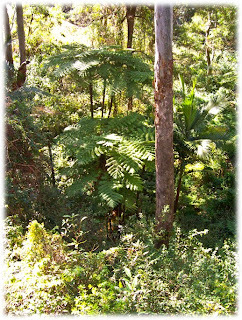 See those lovely big treeferns? 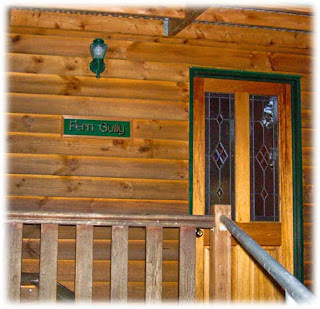 That's what gave this chalet it's name. And I don't know if you can see it, those treeferns are in a lovely, clear running creek that added the perfect background to the bird calls. 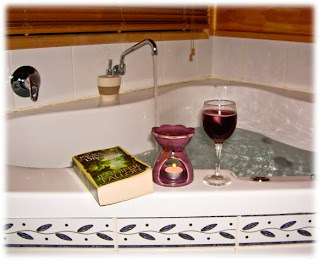 Ah ... we could feel ourselves unwinding already! After breakfast (bacon and eggs a la GB!!) my Beloved settled down to watch a DVD or two, while I opted to head for the balcony to enjoy the trickling stream and the enthusiastic bird life ... along with a bit of quality stitching time!! Hmmm ... not my best look! I seem to have more chins than a Hong Kong phone book!! Oh dear! Thankfully, the view was better to look at and I spent several blissful hours stitching. A "Nanny Nap"!! Awwwww ... isn't it CUTE!! Don't know how he manages to sleep in such peculiar positions and not end up with a crick in his neck!! Aaaaaaaahhhhhh!!! A glass of ... grape juice (Really!! I love grape juice, but don't like red wine ... and it looks so good in the pretty glass!!) ... some soothing lavender oil in the burner ... and a good book (if you like a good fantasy fiction adventure, you HAVE to take a peek at Jennifer Fallon's work!!) ... all ready to be enjoyed with a warm soak in the spa!! BLISS!! What a way to spend the evening ... even if I DID resemble a giant prune by the time I crawled out! Tee! Hee! Hee! It's a Bronwyn Hayes design ... of course!! 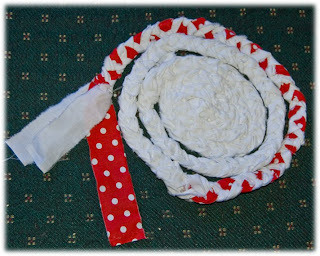 :0) and a start on a project for my loooooong list of things to make for Christmas ... well, that's the plan, anyways! 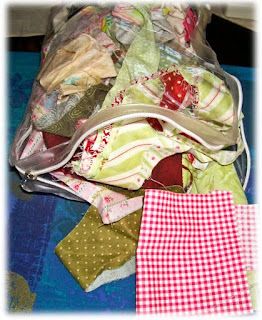 :0) And do you see my GORGEOUS project pouch sent to me by the lovely Joy?? Another Bronwyn design, cos it's an addiction that Joy and I share! 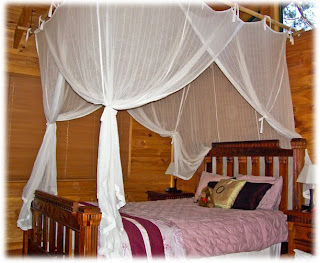 All in all, we had the BEST weekend - so relaxing and peaceful! If you're ever looking for a place to relax and unwind I would DEFINITELY highly recommend a stay at Ravensbourne Forest Chalets! Oh! 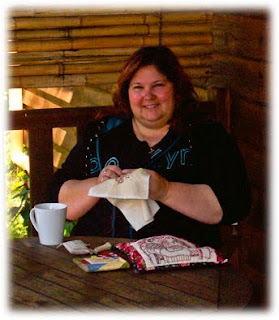 And speaking of Christmas ... which I kind of did when mentioning my stitchery ... 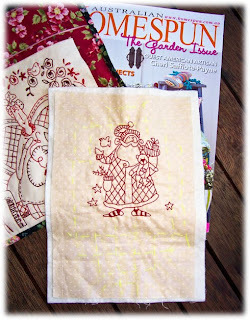 I've signed up for Chookyblue's Secret Santa Christmas Swap for 2009!! When the One Project A Month Challenge became so much bigger than May Britt or I expected (and remembering how frantic I managed to make myself last year trying to meet deadlines!!!) I decided I wouldn't join any swaps this year ... EXCEPT the SSCS, of course! Tee! Hee! Hee! Last year's SSCS was the first ever blogging swap I joined up for and it was so wonderfully run by Miss Chookyblue, that I just had to join the fun again this year - it sure makes swaps more enjoyable when the Swap Mama is so organised and dedicated!! Now, like Santa, I'm making a list and checking it twice ... to come up with some great ideas for gifties to make. Can't wait to find out who my partner is!! And now ... I'm off to make myself a cuppa and read over my script before out "Murder At The Music Hall" rehearsal tonight. It's been a while since I've tried to memorise and I think that, like my computer, I could do with an added memory stick! Tee! Hee! Hee! Hope you all had a relaxing weekend too and that your week is full of adventures!! Til next time - Bear Hugs! 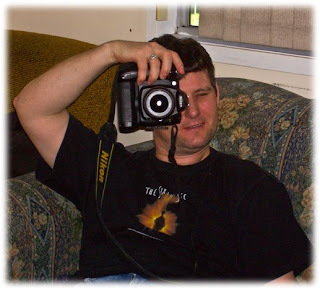 Today is my Beloved Geek Boy's birthday ... and it's a BIG one! 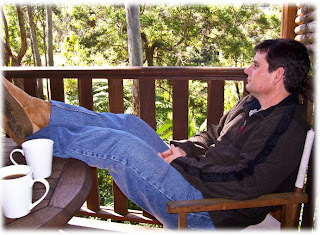 :0) My wonderful husband Scott turns the big FOUR OH today - yep, FORTY! Hard to believe ... especially since I'm only seven months behind him! Above is one of my very favourite photos of my Beloved GB - isn't he just a CUTIE!! 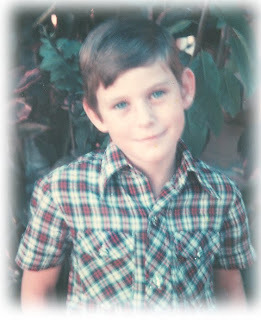 Of course, I think he's still pretty cute today - but he says I'm rather biased! :0) And even though his hair has darkened significantly (not to mention the sprinkling of grey that's amongst it these days! Tee! Hee! Hee!) his eyes are still that gorgeous deep blue! SWOON!! Being a bit of a homebody, he didn't really want a fortieth birthday party, so we had a relaxed dinner with his family members on Saturday, we're going out to our fave restaurant for dinner tonight for a quiet romantic birthday dinner and I'm whisking him off for a romantic weekend after he finishes work on Friday. 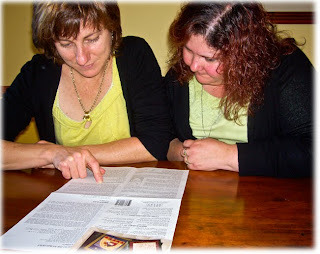 GB and I have been mates for 24 years, married for almost 17 years (next month!) and not only do I love and admire him more today than I did when we were married ... I still LIKE him! 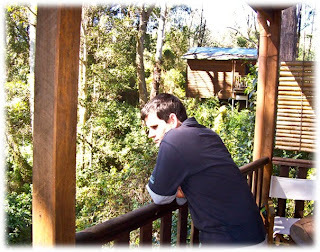 :0) And I'm looking forward to celebrating many more milestone birthdays with him. Two heads are better than one ... right?!?! Tee! Hee! Hee! We did eventually work out what was what and Lynette now has a centre panel to blanket stitch before we tackle the next step on my next visit. 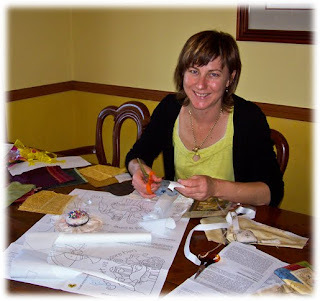 It's quite funny, actually, for ME to be helping LYNETTE when it comes to sewing, since SHE was the one who did Home Economics all the way through high school (the Home Ec teacher breathed a sigh of relief when I chose an alternative subject in year 11! Tee! Hee! Hee!) and is quite adept (MUCH better than me!!) at following complicated dress-making patterns. We worked out SHE's better at PRACTICAL sewing and I'M better at FUN sewing! Tee! Hee! Hee! We had a nice, relaxing day of chatting and stitching - much to Lynette's Mum's (staying with Lynette for a while for some medical appointments!) bemusement! It's been quite a few years since Mrs P has witnessed Lynette and I in full flight!! :0) And do you see that we're wearing the same colour combo? We joke about 'sharing a brain' since we quite often end up wearing the same colours without discussing it, one will ring when the other has been thinking about them and we rarely communicate in full sentences, since we 'telepathically' know what the other is talking about. We find it normal, but anyone else in the room with us soon becomes a little bewildered and lost at our half-spoken conversations! Tee! Hee! Hee! Well ... that's about it from me today. I must shuffle off to pick my boy up from work so we can put on our glad rags ready to hit the town for a big night of birthday celebrations!! OK ... we'll shower and change before enjoying a delicious and fairly sedate dinner! 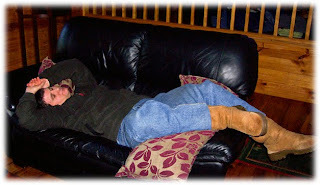 :0) Must be that 'getting old' thing - no wild parties for us anymore! Tee! Hee! Hee! Hope you're all having a great week so far and manage to find some time for fun stuff. Til next time - Bear Hugs! This isn't a fabulous photo, but it was taken by blindly pointing the camera over my shoulder in the car. 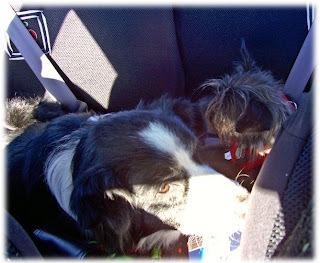 I was trying to catch the dogs all snuggled up together sleeping while we were driving to the coast, but the first flash woke them up without getting a good shot, so this was as close as I could get! They're like kids - when someone's watching, the niggle and pretend not to like each other, but as soon as they're by themselves, they're the best of buddies and snuggle up for naps! 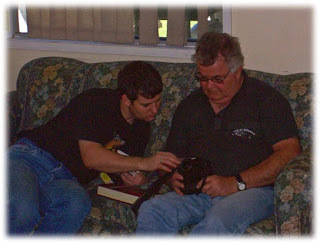 How many men does it take to work out how to use a new camera? Tee! Hee! Hee! Scott and Dad actually read the manual for the digital SLR to try to work out the settings etc. while we were on holidays. And here is my Beloved Geek Boy, having worked out which button to press to make pretty pictures happen! You know, the classic ... he's taking a photo of me taking a photo of him taking a photo of me taking a ...!!! NOT!! Tee! Hee! Hee! More fabric!! 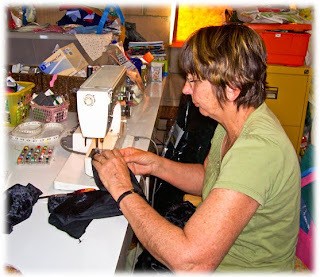 Yes ... once again I've been to visit Marion and Steph at my home-away-from-home, Quilters Angel. 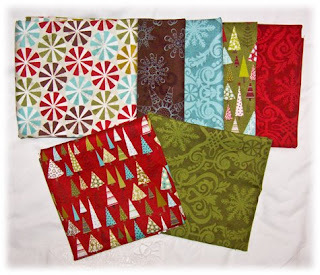 This time, I stocked up on some yummy Christmas fabrics from the "Figgy Pudding" range by Basic Grey. I love that they're not all traditional Christmas colours and patterns - so much fun to come up with ways to use them! Some of these I already have some ideas for, but can't tell you about them yet, and others ... weeeeeeeeellllll ... they were just so darn cute! :0) I think my favourite two fabrics here are the ice blue tone-on-tone fabric and the dark brown background with the ice blue designs - very unlike my usual style, but they grabbed my attention. And while part of me is saying, "NOOOOOOOOOOO! Christmas is AGES away yet!!" the other part of me is already starting to contemplate the necessity of starting soon to prepare for the festive season, so I'll enjoy having a play with these very soon. AFTER I finish the instructions for "Fairy Bears & Butterflies" of course! Tee! Hee! Hee! 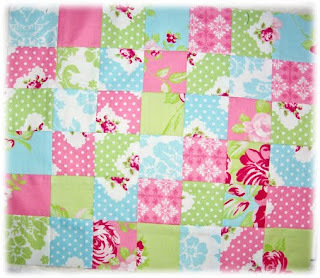 But right now, I'm off to make myself a cup of tea and fondle my Christmas fabrics for a while! :0) Hope you're having a great week so far! Til next time - Bear Hugs! I've managed to be a bit more timely in drawing the monthly draw winner for the One Project A Month Challenge this time - life hasn't been quite as hectic, though still busy enough to keep my occupied! 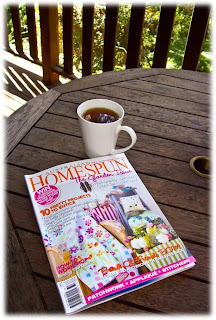 While it's very time consuming to pop around to all the blogs (well, most!) 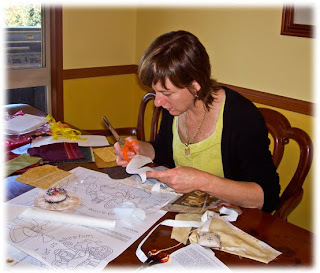 to collect finish lists, it's also wonderful to see all the fabulous projects that people are working on - there are SOOOOOOOOOOOO many clever crafters out there in blogland! It occurred to me, too, as I read, what a privilege it is to peek into people's lives. As I blog hopped, I read how a number of bloggers are coping with cancer treatment, for themselves or a loved one. I read how a mother had lost her son in the conflict in Afghanistan. I saw wedding photos, baby photos, family reunion photos, holiday photos, as well as the photos of fabulous craft creations. And I just wanted to say "Thank You" to all you bloggers for sharing because I can't help but feel our lives are enriched each time we brush up against someone else's life experience, whether it be good or bad. And on the photo/camera front ... my trusty point-and-shoot camera has been FOUND!! YAY!! My Dad rang yesterday to say he'd opened the glove box of his car to get a shammy cloth (not sure that's spelt right, but the spellcheck isn't giving me any other options!!) out to wash the car ... and there was my camera!! I then remembered popping it in there to keep it safe when Mum and I went shopping, not wanting to leave it sitting in the open. Hmmm ... kept it SO safe that even I couldn't find it again! Tee! Hee! Hee! So not only am I relieved that I won't have to replace it, I'm relieved I'll be able to take happy snaps when I head off on my adventures, since the SLR was WAY too bulky to pop in my handbag! And now ... I'm off to run some errands for my Beloved Geek Boy, who has started painting the newly renovated kitchen - will show you some update photos once there's progress to see. 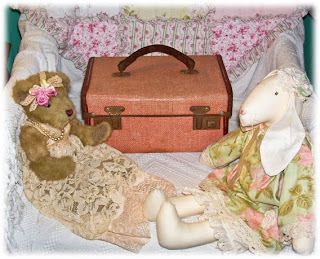 Hope you're all having a fabulous weekend and Til next time - Bear Hugs!